A look into how KPIs are used to measure the success of marketing campaigns. This is why marketers need to precisely define criteria for evaluating the performance of their efforts. They must be able to identify which campaigns are most successful, and more importantly be able to understand which aspects of those campaigns are most successful and apply them to future campaigns. Analyzing the performance of a campaign should be developed with a precise methodology created with appropriate KPIs in mind. 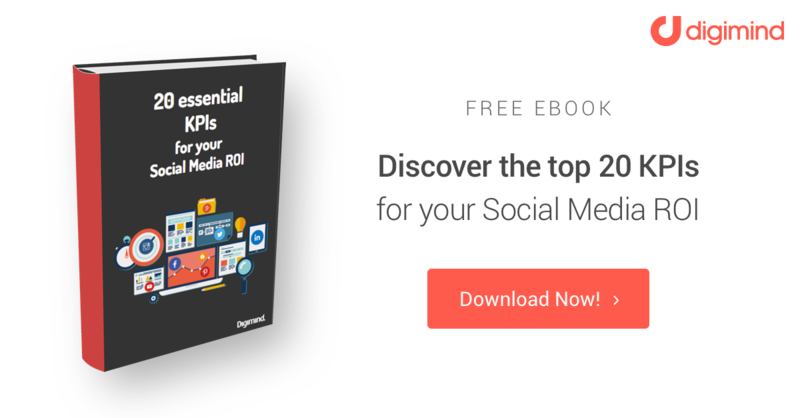 For more on building effective KPIs, you may find our e-book entitled “20 Essential KPIs to Optimize your Social Media’s ROI” here. Campaign analysis must go beyond owned media (a brand’s self-managed social accounts) to actively listen to spontaneous conversations on the web and social media (earned media). When well-organized, data often speaks for itself – creating dynamic dashboards makes data visualization and decision-making processes simpler. The results of these analyses are not helpful unless they’re shared. Develop targeted and personalized reports to be presented to clients and colleagues. An example of a Digimind Social dashboard with campaign-relevant analytical graphics. Here are three key strategies for choosing appropriate KPIs for analyzing the success of campaigns. At the outset of any marketing campaign is the challenge of defining overall strategy and goals. How is social media related to these strategies and relevant internal operations? Which departments will be involved in the project? Once the campaign’s objectives have been well defined, selecting corresponding KPIs is necessary for determining ROI results. For example, if a brand’s goal was to gain brand visibility, they might be interested in KPIs such as acquisition, social media interaction, customer satisfaction, and conversion rates. It’s important to ensure that relevant KPIs are always chosen based upon the initial goals of the strategy. Choose marketing KPIs based on the campaign goals. A popular method for defining objectives and performance indicators is the SMART method. This method dictates that goals should always be Specific, Measurable, Attainable, Relevant, and Time-Related. Performance indicators should be chosen based on business objectives which are well-defined, measurable, achievable and lead to the collection of useful results over well-established time periods. A regional council in France used Digimind’s social listening tool to monitor the impact of social media in promoting its regional campaigns. These campaigns were aimed at educating the region on the development of new high-speed train lines between Paris and the region. As the new lines were mostly broadcasted via posters in the Parisian metro, the council supplemented their campaign with social media efforts. In less than 2 weeks, the council created over 200 data-visualized graphics and broadcasted them on Facebook and Twitter using the official hashtag of the campaign. Digimind’s social listening tool made it possible to detect the geographic locations, messages, and people that were most impacted by the campaign. For example, it was found that those within the council’s region found this campaign to be more important than Parisians did. Social media analysis was also helpful in detecting major audience influencers through evaluating the sentiment of the interactions associated with the campaigns. This analysis led to the categorization of 3 main stakeholders in the campaign’s promotions: businesses, the region’s inhabitants, and activists. A graphic tracking audience reach over time, via Digimind Social. When measuring the impact of marketing campaigns, there are many methods of analysis depending on which KPIs are applied. However, there is a common denominator, the social insights gained from analyzing the target market are always helpful for understanding the performance of a brand’s campaigns. Additionally, scheduling analysis intervals is helpful for comparing results over time to retroactively compare data and recognize trends. Perform Socio-Demographic Analyses: analyzing the target audience based upon socio-demographic criteria before and after a campaign is massively useful for customer profiling. A social media listening tool targeted at analyzing and organizing socio-demographic data on a target market can be a huge asset in any campaign. Measure Growth: increases in social media following, reach, and engagement are indicative of successful marketing efforts. All three of these indicators demonstrate increases in brand visibility. Analyze Periodically: measuring the same indicators on a scheduled periodic basis – biweekly, for example – enables marketers to analyze trends in the efficiency of campaign efforts and decide which aspects they should optimize and which to cut. Frequent analysis of indicators is helpful in determining which insights are most valuable to a brand addition, thereby increasing the operational efficiency of analytical efforts. A retail company partnered with Digimind to implement social listening into its marketing strategies in order to perform campaign analysis, evaluate ROI in terms of brand visibility, and to collect consumer feedback with communications campaigns. Sentiment and number of mentions: to improve social media engagement activities and the overall content marketing strategy. Analysis of influencers: to detect potential brand ambassadors and integrate their content into the marketing strategy. Effective social channels: to optimize paid and organic searches. Social listening enabled the brand to measure the impact of their communications campaigns in real time and optimize the efficiency of new campaigns and social media engagement strategies. Collecting all relevant campaign indicators and compiling them into accessible visuals makes data more easily understandable. Dashboards within Digimind Social concentrate social data into easily presentable analytical graphics which are updated in real time and customizable according to the needs of the brand. A clothing brand employed Digimind’s social listening services to evaluate an advertising campaign supporting the launch of a new shoe collection for the spring-summer season. The objective of their analysis was to measure ROI of the advertisement in the first three days after its release, identify the main channels of generated conversation, and to find social media influencers and potential brand ambassadors. The brand felt that it was essential to use dashboards for this campaign to monitor the ad’s success and to easily report this success to management. In addition, the standardized reporting of Digimind’s dashboards made it easier to compare success indicators with subsequent campaigns. Remember – KPIs are dynamic. A successful campaign regularly adjusts its indicators in order to analyze verify the success of the campaign as it progresses. For more content, keep up with us on Twitter: @digimindci.